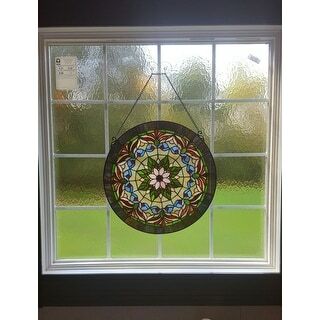 This has very pretty colors &is well made, it is hanging in front of a round window I have to add privacy but still lets in light with beautiful colors from the stained glass. 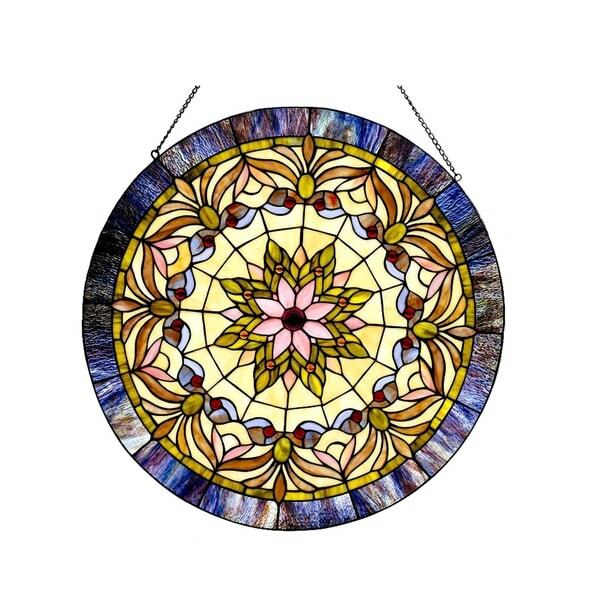 With Tiffany characteristics, this handmade stained glass panel has soft colors of purple, greens, pinks, yellows and a star motif in the center. Your own Victorian light explosion every morning. This stained glass product has been protected with mineral oil as part of the finishing process. Please use a soft dry cloth to remove any excess oil. The shipping and packaging was excellent as usual, thanks Overstock! This window panel is made of art glass, which can be confused with plastic, but it is indeed "art glass" which is a great alternative and very budget friendly. The colors of this window panel in real life are actually much more vivid, stronger and a bit darker. For example, the outside blue edge of the window panel was more of a royal blue and dark purple than the soft steel blue shown online, but I really liked that and found it to be striking. Also the small dots around the flower are a true red, which is just beautiful when the sun shines through it. When this window panel is hit by full sun it comes alive, and almost looks like a tiffany shade with the lights on. The pink center flower is more of a dusty rose, a little bit darker than the color shown online but again I think it's lovely. If you're not particular about an exact color match or you happen to like stronger color,s you will love this window panel! I would definitely recommend it to a friend! I took a lot of time to research the reviews on different window panels and was hesitant to pick this one, as some reviews said the outer ring of glass was more brown than blue. I couldn't disagree more! The colors are vibrant and spectacular! The outer ring is a beautiful blend of blues and purple. I absolutely love this window panel! I've done a lot of online shopping from other websites, but this is my first purchase from Overstock and my first review ever written. I am pleased with the service from this website and was also quite impressed with the packaging of this fragile item! Thank you Overstock! I bought this window panel to hang in my bedroom window. It is hard to describe how beautiful the colors of this Tiffany window panel are when the light shines through. I love to wake up to the sun shining in, casting light through this glass panel. This is the third Tiffany style window panel I have purchased from Overstock for my house and I love them all. service provided was excellent, received before estimate. Biggest surprise on opening package was to find the design and color so much better than the web picture. This could not be helped as photo needed an unlighted background. item is designed to be backlighted, as in a window. Changing light gives different colors with each view. Hanging in a window, night view is match for photo. In daylight it comes alive. The window panel is very good overall. Like the design, it is well constructed, ha a nice design, and excellent colors of glass. This is a very nice piece of stained glass. 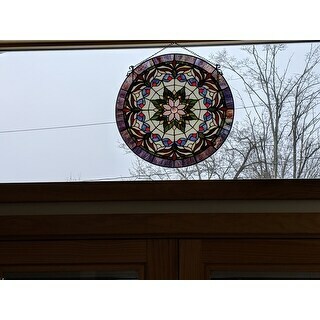 We hung it in our window that borders the top of our over-sized fron door entry and it is really lovely. Subtle colors, yet so lovely whether in the early morning sunlight or the dusk light, we are VERY pleased with this purchase! 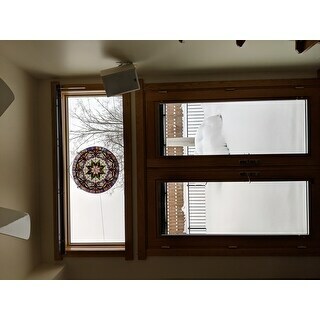 I use these windows for the top half of my double paned windows to create a picture when looking out. The sun comes in and it is the focal point. I live in the city and have the corner house. I have two rectangular tiffany window panes from Overstock in the other two windows and will get another pattern/size for the last window. The colors in this particular window are the milky glass with red ruby clear bubbles that the sun catches every morning. Yes I have loved Overstock's windows since 6 years? I think it was that long ago. Expecting a stained glass panel from Switzerland, as the description states. The photo dipicts elegant color harmony. The actual piece is labeled "Made in China" and displays garish colors: bright red, bright green and white, circled in a brownish-purple, not blue ..... Disappointed but found a less conspicuous window to hang it, and I do like the pattern. Its not a piece I'm proud to show off: might return it, or might go to the craft store for glass paint to tone down the colors, or just wait a week & see if I grow to like it better. Also, a few of the glass pieces are only partially surrounded by leading. These pieces are made in china by non artist on a production line basis and should be purchased with that in mind. the solder lines are very irregular and the overall workmanship is poor but to the untrained eye they look fine and when you factor in the price the beauty of the piece is very acceptable. I purchased two and used them outdoors to cover an unsitely window and they look beautiful. Very flimsy for the size (almost 2 feet in diameter). It feels like it will break when you pick it up. I bought this for a gift and was disappointed as it seems cheap with the flimsiness. Colors are pretty though. this is a very: colorful glass window panel. It came well packed in cardboard and Styrofoam. The glass pieces are exceedingly well cut and closely caned with thin black metal. bonus is light enough to hang! The third picture shows differences between the thickness of the caning between an antique window panel and a new kind.look closely see the cardboard and bubble wrap it came pack in. I bought two to hang in front of my bedroom windows. It gives additional privacy since I'm facing another apartment complex. When I stepped outside to take a look, it was just as beautiful from the outside as they are on the inside. I love the colors. I have not hung it yet but it is lovely. It is much bigger than I expected. I would recommend this to a friend. This window panel is gorgeous! It was larger than I anticipated but is going to make a perfect Christmas gift. The colors are so bright! Great piece. Also was happy with how it was packaged so that it was protected and didn't come broken. It's prettier than the picture indicates and fits my window perfectly. it weighs a lot so we had to be careful hanging it. I absolutely LOVE this window panel. Fits beautifully above my bath tub and the evening sun shines beautifully through it. I plan to purchase more from overstock while decorating my new home. Beautiful with the sun shining through it. Bright colors when the sun hits it. I love it. I have mine resting on the window sill but would estimate it to be about 10 pounds. The chain is strong enough to hold it, however my windows are not large enough to hang it. "Is this piece made and assembled in Switzerland?" It says Made in China on the box. Good colors, right size for our round window, good price. I chose this product because it looks very pretty, and the price was right. Good price and good reviews. I thought this was beautiful. Size and colors, looks beautiful, hope I am not disappointed. IT looks beautiful in the window with the sun shining through it. I love it! "Is it 22" in diameter or 27"? Both are listed in the description..."
Hello midcenturygirlie, this is 22 in diameter. Have a great day! "Does product have all hanging assembly?" 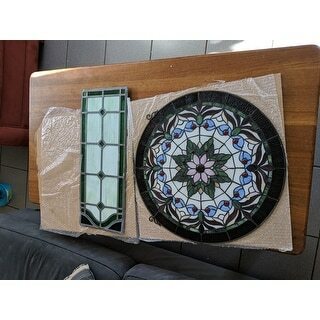 Hello mamab55, the Tiffany-style Victorian Window Panel, comes with hardware.. Please feel free to contact us again with any further questions. Thank you for shopping with us! "How long is the hanging chain"
The hanging chain is 30 inches long. How you hang your curtains plays a big part in how functional they are and how well they complement your decor. Use the following four steps to easily hang curtains on any window in your home. A basic necessity for draperies, curtain rods can add real pizzazz to your window treatments. Curtain rods that are too long, clash with your curtains, or are installed improperly are all big no-nos. Before we dive into the fun stuff, it's time to make sure you know the basics. We've got all the curtain rod info you need to know before making a purchase. Think of this as Curtain Rod 101.